DOCman works seamlessly with Joomla’s built-in search functionality. For better results DOCman also provides its own custom search in list views. Document indexing: with Joomlatools Connect you can search for text inside DOCman files. Searching indexed files is supported through Smart Search, good old Joomla search, or DOCman’s built-in search. Default installation of DOCman has 2 plugins that make it possible to search documents through Smart Search and good old Joomla search. No DOCman specific configuration is required for this feature to work. The search results link directly to the document files. DOCman has its own specialized search feature on the Hierarchical and Flat list views in the front-end. Go to the DOCman tab and set the Enable document search option to Yes. Go to the menu item in the front-end and see all the search options. 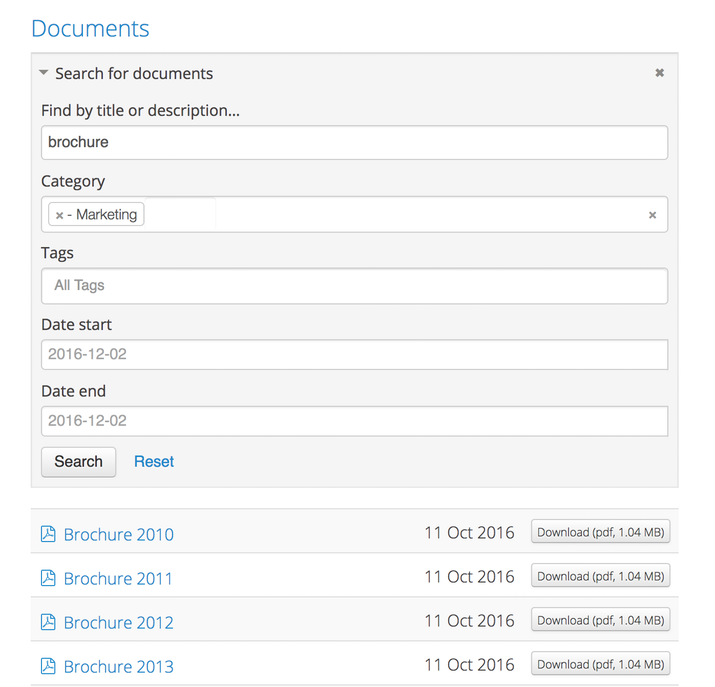 You can filter documents by title, description, category, tags, and start/end dates. Search results render within the same page which means the menu item settings are all preserved. Note: DOCman search indexes documents but does not index document categories.